Saibal Mukhopadhyay and two of his Ph.D. students won the Best Paper Award at the IEEE/ACM International Symposium on Low Power Electronics and Design (ISLPED), which was held August 11-13 in La Jolla, California. Mukhopadhyay, an associate professor in the School of Electrical and Computer Engineering at Georgia Tech, leads the Gigascale Reliable Energy Efficient Nanosystem (GREEN) Lab. He shares this honor with his Ph.D. students, Boris Alexandrov and Khondker Zakir Ahmed. The title of their award-winning paper is “An On-Chip Autonomous Thermoelectric Energy Management System for Energy-Efficient Active Cooling.” Thermal management is a key challenge for today’s integrated circuits (IC) operation. In the past, researchers have studied the use of thermoelectric coolers (TEC), which provide additional cooling when a current is passed through the device, for on-chip cooling. Embedding a TE module (TEM) within the package has shown potential for on-demand cooling of ICs, but the need for this additional energy reduces the effectiveness of TECs and has been a key concern for their use. This work presents and experimentally demonstrates a major step to alleviate this challenge. Mukhopadhyay and his team have developed an on-chip thermoelectric energy management system for energy-efficient, on-demand active cooling of integrated circuits. The proposed on-chip system monitors the IC temperature and provides cooling during critical thermal events by sending a current through the TEM. When the temperature is not high enough, the same TEM is used to harvest the otherwise wasted heat energy generated by the IC and reduce the net cooling energy. The design is implemented in a CMOS test-chip and tested with a thermoelectric device. The successful demonstration of this control system will fuel innovations in thermoelectric devices, as well as in the architectural techniques to address the thermal challenges of future processors. 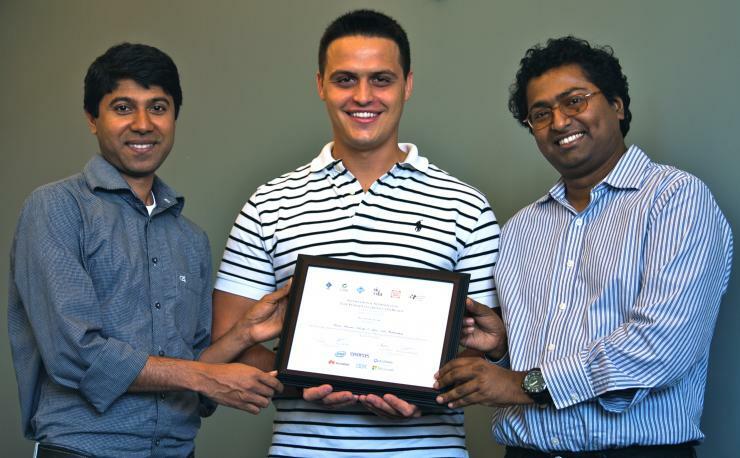 Pictured in the above photo from left to right are Khondker Zakir Ahmed, ECE Associate Professor Saibal Mukhopadhyay, and Boris Alexandrov.